As a kid, my mom would have me sprinkle sulphur around my ankles and waistband of my pants to keep the chiggers away when we were gardening. It caused no irritations. Sulphur is also an ingredient in some older soaps for acne. So, I would think you should have no problems for bathing with it, though because of sulphur's use as an acne treatment (drying most likely), it could be irritating in enough quantity. Exercise reasonable caution as you would approaching a new cosmetic or soap. Yep! We also used powdered Sulphur mixed with lard as an ointment for dogs with "hot shots" and straight powdered Sulphur to prevent chiggers. I think that's why it is used in a number of formulas to drive off enemies. hey all how are yall doing? my question is on sulfur. Rather than asking questions about each natural product used in hoodoo, you might also want to invest $14.95 in a copy of "Hoodoo Herb and Root Magic" -- which will provide you with 224 pges of information on 500 herbs, minerals, and zoological curios. hey catherine ive tried o buy your book a few times. I have yet to find a store that carries it. ive tried borders and barnes and noble they always seem to have some excuse about why they dont have it or cant get it so as far as me getting that book it may be a while. Also i thought that sulphur would be in incense --sorry my mistake. You can order my book from amazon.com or from luckymojo.com and some of the stores that sell our products carry it as well. If you buy it from Lucky Mojo, it will be signed by me. Is there some reason you think you have to buy it is a bricks and mortar shop? I mean, why not purchase online with a debit or credit card or via mail order with cash, check, or money order? 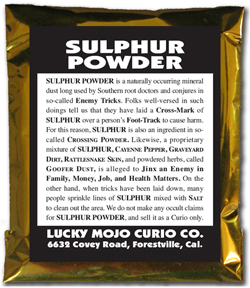 With regard to sulphur being an "incense" -- no, it is a mineral, but it is a mineral that can BURN. That is why it is also called brenstone or brimstone -- the term is Old English for Burn-Stone -- the stone that burns. In the old days -- in hoodoo as well as in European folk-magic, Sulphur was burned to totally, completely, and absolutely eradicate evil from a building. The smoke is HIGHLY TOXIC. Do not try this at home! The powder itself is not toxic in the way that the smoke it. Therefor it is added to baths, shampoos, and other household goods, including organix insecticies. Anyway, here is the link to purchase Sulphur. catherine i dont have credit or debit or anything of that nature the best i may be able to do would probably be money order even then it would take so much longer seeing as i have to waite for it to get to where ever its going and then waite for it to be shipped its long process but i get what your saying. yoopylucks, I get around this by buying disposable gift cards. I don't know if they have them where you are but its worth looking into, they work like a debit card with a fixed amount, when you're done you just throw the card away. Yes, yoopylucks, we do accept gift debit cards and disposable debit cards, although we have sometimes had trouble getting our system to accept them if they are not properly activated. They sometimes come up declined when they should not. We will contact you if and when that happens. Money orders are just as easy to use, in my opinion. It takes 3-5 days for a money order to get here by first class mail from almost anywhere. They are as good as cash and your book will ship the same day that we receive the money order. Is it a wise idea to use it with an Uncrossing spell as a bath. For example, like if I was to use my 13 Herb Bath tea bath and also bath with the sulfer soap? Yes, Sulphur soap can be used alongside Uncrossing Bath Crystals and/or 13 Herb Bath. 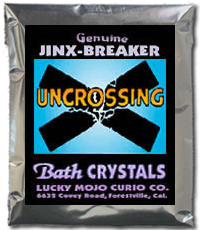 It makes a very nice combination with the Uncrossing line -- in particular with Uncrossing Bath Crystals, which you dissolve in your bath water. I am a little confused about sulfur and can't figure out my answer in this thread. Is it unsafe to burn sulfur on candles? I swore I've read of people using it on candles here which means it would, in a sense, be burning. Is that small amount really toxic? Or am I so off that it shouldn't be used on candles? Because I have been using it on break up candles along with break up type herbs and oils. Burn it outside. It is one of the key ingredient in matches. It has a distinctive smell. thank you, I will stop burning it inside then. Just wondering i have acne and the only thing that helps contains sulphur. So from what I understand its great for banishing and keeping away evil (probably why some trouble makers in my life just couldn't succeed in their plans), but does it interfere with good spells? Like does it cancel them out? Sorry if this is a silly question but I'm new to this! Unless you've been asking the sulfur to cancel out your other work will it won't affect it. The same way eating cayenne in chili won't cause people to fight or leave their homes unless it is cooked with that specific intention; nor will lemon-poppy seed cake sour and confuse someone unless it was made to do that! Lol thanks Aura. That's a great way of putting it! i gonna burn it on a charcoal with ginger powder like Miss cat say on the HOODOO HERB AND ROOT MAGIC BOOK for a good start of my new club but i don't know which amount of sulphur to put on the charcoal,let me know please. I was wondering if someone could help me with a blowing ritual. The ritual is to blow your house out. There is sulphur put in each corner and set on fire. The process is suppose to make your house clean and lucky. I know there has to be a lot more detail left out, but that's all I know. The information was collected and published in Volume 1 of "Hoodoo Conjuration Witchcraft Root" by Harry Middleton Hyatt. Sulphur used to be burned in closed houses or rooms to kill pests -- everything from ants and rats to crab lice and bed bugs -- but if does smell bad, it will stain all silver and silverplate black, it will darken wood finishes -- AND it is highly toxic if you breathe the fumes. It's magical use developed from, and parallels, its practicl uses: it cleans away anything that is bothering you, so that your natural luck can come out. It is used in forumals to get rid of bad things as well as to create luckiness by their removal. We do not recommend burning sulphur. As a powder ingredient that is not burned, it is not toxic in that way. I bought the dume candle and I'm using it on an enemy. I sprinkled some sulfur inside the 7 day dume candle and its smells really bad. I'm in an apartment and cannot put it outside without everyone outside walking by that could take it or trash it. it smells, it isn't smoky but its melted in the wax and just smells. Is it toxic to smell it without it being smoky? I want to continue this spell but if I have to put it outside I can't and most likely will start over and put very very little sulfur in the candle spell this time around. Well, SULPHUR JUST STINKS TO HELL. That is its nature. That is what it is for. Breathing the burning fumes is toxic. Smelling it is not harmful. Some folks burn these in storage lockers to keep them away from the home. I forgot to add sulphur to my order, so I read about it in the order catalogue. Since it says that it's in crossing products and goofer already, would it be necessary to order it anyway? It is in goofer and crossing products, am I correct?